The day till now had been exciting - with us visiting the Sensoji temple, the Hibiya Garden and enjoying a cruise along the Sumida river – and there was still more to be seen... now in the fall of the night. We made our way through the streets of the city, past the adorable dolls at the Zozoji temple and finally reached the iconic symbol of Tokyo, the not-to-be-missed-by-any-chance spot of the city – The Tokyo Tower. Built in 1958, the tower takes pride in being the world's tallest self-supporting steel tower. Once a symbol for Japan's rebirth as a major economic power, today it has become a face for the country. Bearing a striking resemblance to the Eiffel tower in Paris, the tower looks splendidly magnificent, from any and every angle you will saw. Its excellent architecture and unbelievable attention to detail is an apt representation of Tokyo itself – known for its flair for flamboyant architecture. One long look at the sparkling tower and you’ll realize why it must have been accorded the privileged iconic status by the city. As advised by the hotel staff a couple of minutes back, we purchased tickets for the 150 mtr. main observatory and made our way upwards towards the viewing deck through a lift. The scene was chaotic. The room was dark and filled with a lot of people everywhere. With this thought in my mind, I left the views of the window to explore the other attractions present inside the tower. Ascend one level down and you will find some more souvenir shops where you can roam around and take a feel. Besides this, it also houses a wax museum and an aquarium. However, remember that separate entrance fees may apply for these. 1. The tower has 2 levels to view the city. You can either ascend to the main observatory located halfway at 150 meters or go further up still, till you reach the special top level observatory at 250 meters to treat yourself to some amazing views of the entire city of Tokyo. If you decide to go all the way to the top, you will have to shell out an extra 600 Yen. I would recommend that middle level viewing is quite satisfactory enough. 2. Besides the observatories, the Tokyo tower also serves as a television and radio broadcast antenna and a tourist attraction as a whole. 3. Recently, in May 2012, the Tokyo Skytree was added to the iconic map of Tokyo. As of now, it is booked 3 months well in advance, so you might just have to satisfy yourself with a glimpse of it only from the outside. Look out for: Mount Fuji - apparently, on a clear day you can spot it in the far distance but from the topmost level. Get a subway ticket for: Onarimon Station on the Mita Subway Line or Akabanebashi Station on the Oedo Subway Line. You can also walk there from Hamamatsucho Station on the JR Yamanote and JR Keihin-Tohoku Line in about 15 minutes. Timings: 9:00 to 22:00 (entry until 21:45 to 150 mtr deck, until 21:30 to 250 mtr deck). Open on all days. 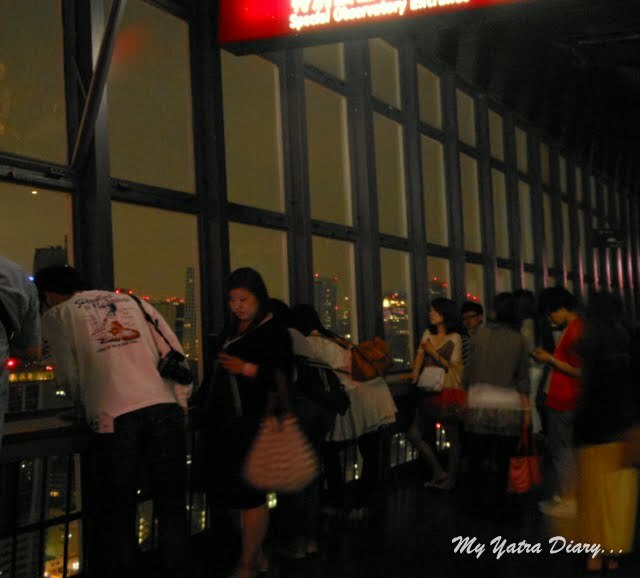 Charges: 820 Yen (to main observatory – 150 mtr), 1420 Yen (to special observatory – 250 mtr). Such a wonderful city and my first thought was that the Tokyo tower was the Eiffel tower!! Terrific captures and a wonderful tour that you've taken us on, Arti!! Hope you have a great week! the view of night sky....awesome!! beautiful sights Arti, and love your dynamic and reflective thoughts in the midst of the twinkling lights in such a huge and wonderful city. After reading this post, I want to visit Japan now! The views from the top are truly stunning! You are so lucky to have the experience! How beautiful. You got a great shot. I also like the tower as well as Sky Tree. There's nothing better than seeing a city from above. You got some great pics at night. I was not aware Tokoyo had this tower and really does look a lot like the Eiffel Tower. What a magnificent view you had of all the twinkling, neon lights down below. Love the little dolls at the Zozoji temple. @Arti Good morning. Welcome back. 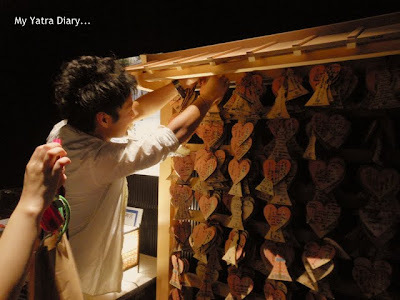 Great to read your new post on your Japan Yatra. Truly amazing photographs, Awesome view of Tokyo city . Thank you so much for the beautiful description about “Tokyo Tower”. neon drenched clicks looks beautiful and the tower seems so similar to eiffel tower. Enjoying your Japan trip thoroughly, Arti with these lovely pictures and description! Beautiful photos, Arti. This particular tower was built after we returned from Tokyo. Very nice. 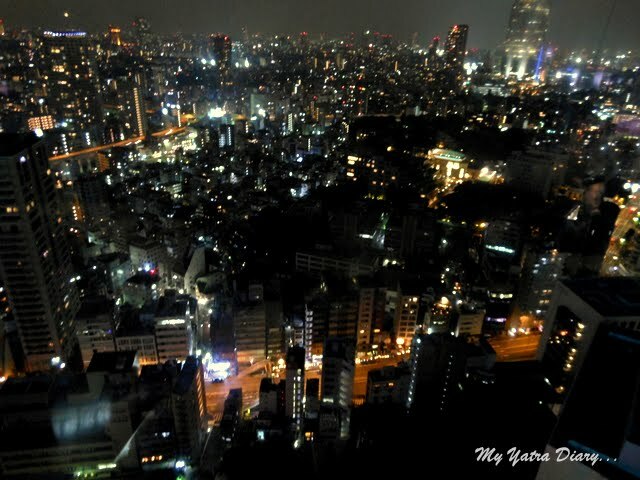 It is said that, to save power,the night view in Tokyo has become darker since the big earthquake last March, but still powerful and beautiful. I came back home from Tokyo yesterday. I saw Tokyo tower from Roppongi hills. You remember the spot? Splendid views from the tower. For a second i thought it was the Eiffel. oh wow .. Look at that tower , I loved it its looking beautiful with all the lights and all ..
Looks like Futurama to me, like a film scene! Am sure the sight was fantastic Art! The night view from the tower is really something! I only visited it in daytime. of Tokyo Tower, still I think it will never loose the strong presence in people's mind. The first picture of it is great! All the cityscapes are nice. What a fascinating way to finish the second day in Tokyo, Arti! You must have felt satisfaction and comfortable fatigue that night. I love Tokyo Tower. While looking at the breathtaking night view on your photos, I made a question if the brilliance of the lights reflect the true meaning of prosperity at this time when we’ve saved power and are thinking again about the energy source and lifestyle change in Japan. Have happy days! You went to Tokyo tower in the night.It's a good idea. 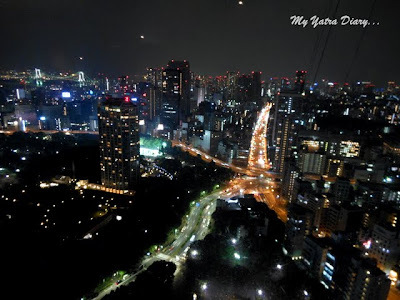 I also want to see the night view from Tokyo tower though I have been there in daytime long ago. But I am enjoying the night view from your photos. Thank you! What vibrant shots of the city! Oh my goodness, those night time shots of the city are breathtaking, like nothing I've ever seen before, I'm in awe of all those lights. What beautiful shots of Tokyo--and how cool you can see Mount Fuji! The first picture is gorgeous. That Tokyo tower looks very much like Eiffel Tower in Paris. Have heard of it before is it taller than its counterpart or what ? At 150ms up it would be scintillating to watch Tokyo. What amazing shots of the tower. My first call. The pictures bring out the magnificence of Japan - a country I admire! 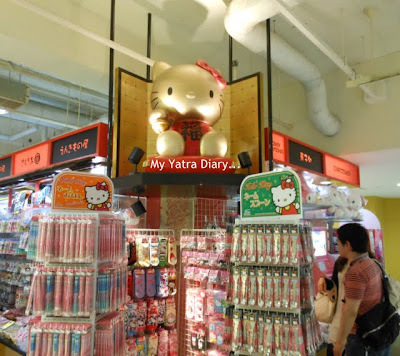 Arti, What splendid photos of your trip to Japan! These night pictures showing the glittering city are fabulous. I have been to the tower during the day, but never at night. With any tower, one should experience both, if possible. The lights are spectacular and I love souvenir shopping. Very interesting post. I had a fascination gfor the Tokyo tower from my younger days when I received a Picture Post Card from one of my pen friends in Tokyo. I believe it is nearly 50 years old. What an amazing series of photos! 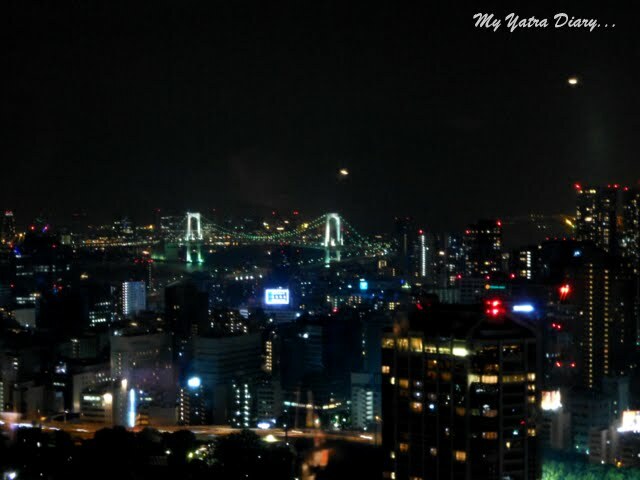 I like your night city shots..beautiful! What a perfect place to view the Big City! Wonderful pictures of the tower and the panaoramic views. I love your descriptions of what it looked like and how you felt on viewing. I would definitely skip all those other attractions up there in favor of spending more time just gazing down. those scenes from the tower are extraordinary. what a breathtaking view that must have been. so alive, and yes, pulsating. you've captured the feeling of it beautifully. how exciting it must have been to take this all in. happy week to you Arti. The words were so lyrical! Totally made the lights in the photos twinkle!I almost felt as though I were there. Sorry, I missed this blog. I think the Japanese, who are about the age of me, have special sentiment and nostalgia towards Tokyo Tower. 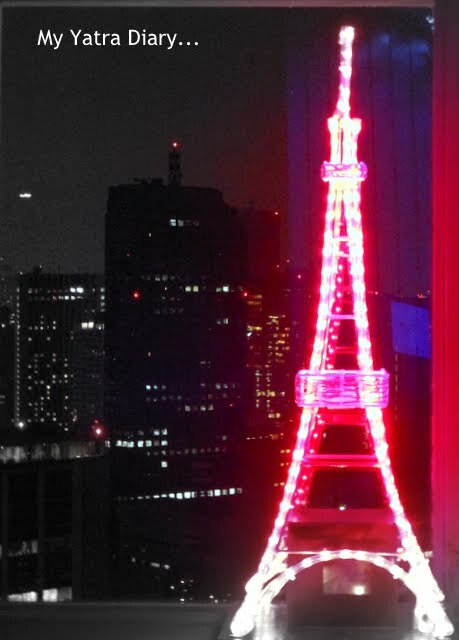 One year after Tokyo Tower had been built as an antenna for TV, the parade following the wedding of the Crown Prince to Princess Michiko was broadcasted. It was the symbol of the hope of the new age after WW２. We saw Olympic Games held in Tokyo in 1964 through TV. We felt the recovery of Japan. The tower showed us always the history of the recovery of Japan. Arti, I am very glad that you enjoyed the tour of Tokyo Tower and like it! Thanks for stopping by, as always your visit was a pleasure. I had been to Japan and its only in Osaka which I was mostly sightseeing and this Tokyo tower fascinates me more each time I saw posts about it. Reading your posts is better than visiting the place myself! That's an impressive tower, Arti. It looks like Eiffel Tower. The panoramic view of the illuminated city is breathtaking!! 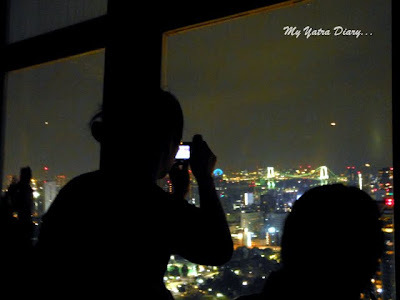 You have given me a wonderful tour of the city Arti-the pictures of the city at night are truly great. WOW..mesmerizing pics... I am reminded of my Eiffel trip... Btw I have written my first travelogue, hope you will read it and soon will write more. In fact after reading this one, I want to write about Paris. Beautiful views from the tower. I did think it looked like Eiffel tower and lo! You had made the same comparison...Superb photos! The view is really breathtaking!!! I really thought it's an Eiffel Tower, Lol! :) ;) Your description & pictures are beautiful. I think your most memorable one would be the view from window, right! Japan is one of my Dream Destination .. its the only place tht has fascinated me so much .. you are truly a travel blogger .. and yes a very good photographer as well .. keep on good work.